​​​​​​ VICTORIA – Five months after a fire destroyed Diamond Fiberglass' entire plant structure, officials are almost ready to begin construction on a new, more efficient plant. Structure designs are complete, and officials are working to close finances for the construction deal; once the final step is complete, they can begin construction, which will take about three months. 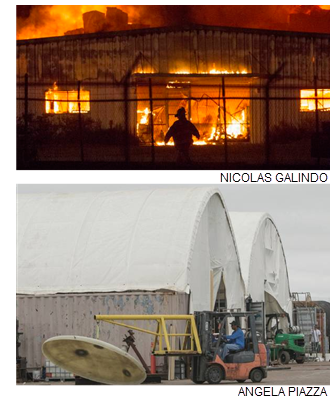 Diamond Fiberglass, founded in 1986, manufactures custom-engineered fiberglass reinforced plastic vessels or tanks and operated from its 35,000-sf facility on an 11-acre site in Victoria before the plant burned down. Most of the tanks Diamond Fiberglass produces go into water treatment plants or are used to store chemicals. Diamond Fiberglass is one of few companies that has an American Society of Mechanical Engineers Reinforced Thermoset Plastic Corrosion-Resistant Equipment Certification, which enables the company to build at the highest level.